Have your cake and eat it too! 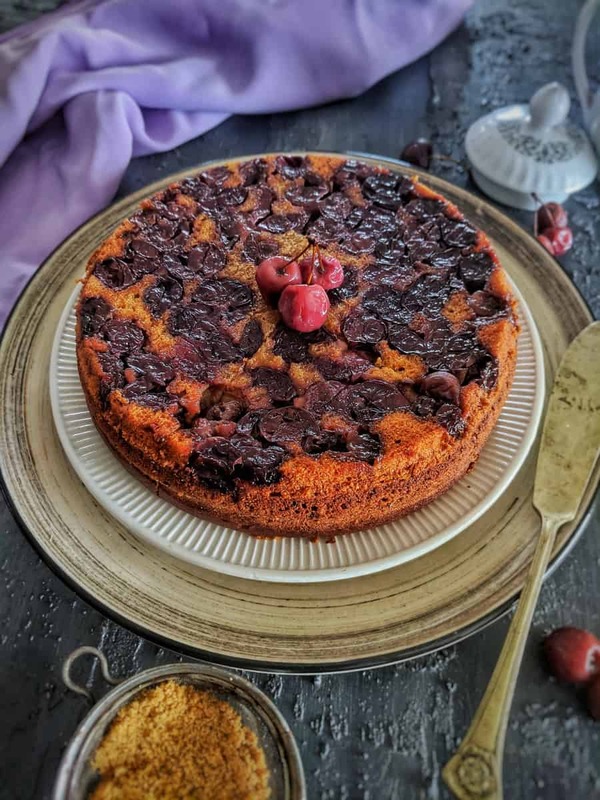 – is the mantra I firmly believe in and impliment in all of my baking  Take this cake for instance – tartness of caramelized cherries, comforting texture of ricotta and goodness of wholewheat flour come together to present a healthy indulgence – something you can never say no to! This must be one of the very few times that I did not make a chocolate-based cake and end up regretting that immediately, since this cake was a welcome change from my usual chocolate indulgences. Italian ricotta cake is typically made from semolina, but I used whole-wheat flour for its higher protein, fiber and thiamine profile and could still attain the intended soft and tender texture. I make my own ricotta, aka unset paneer usually by curdling boiling milk with lemon juice or vinegar and straining the curds through a cheesecloth – it’s way tastier, cheaper and handier this way as compared to the store-bought version. Using full-fat milk or adding heavy cream to skim milk gives great results. 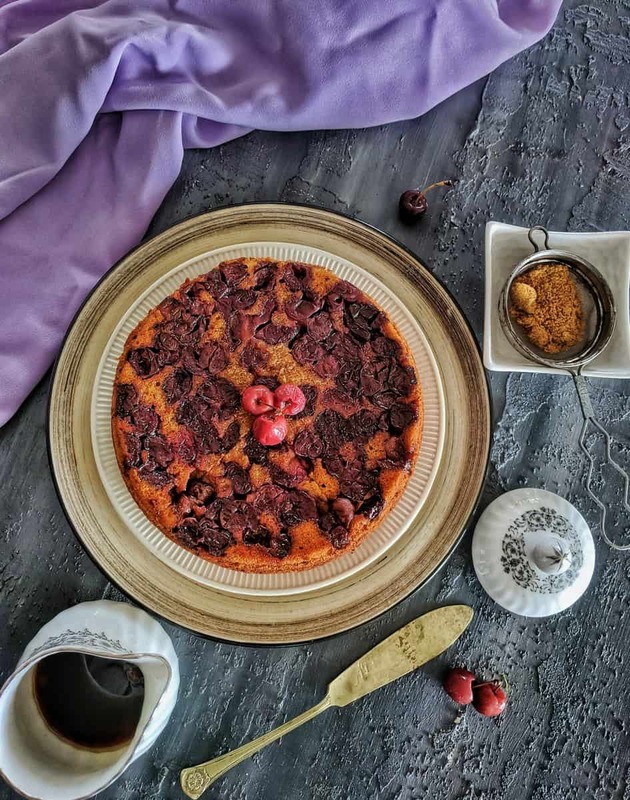 Using cherries came as a last-minute, quick flash – I had sourced cherries from Hyderabad and they were sitting rather sorry in the refrigerator, which prompted me to turn this into an upside down cherry ricotta cake! You could substitute cherries with other fruits like pineapple, plums or pears even, but be mindful of the moisture content of the fruit used and adjust the consistency of cake batter accordingly. If you’re looking for healthy bakes, do your hand at my Pumpkin Spice Barnyard Millet Cake with Cashew Butter Icing, Wholewheat Chocolate Ganache Cake, Mango Saffron Oats Whole-wheat Muffins or Chocolate Banana Muffins with Millet Flour Mix too! Grease a 6-inch pan (preferably springform) with butter. Add 1.5 tbsp palm sugar, lemon juice and salt. Arrange the pitted cherries evenly and place the pan in the oven for 15 minutes. Mix all the dry ingredients, i.e. flour, salt, baking soda and baking powder in a bowl. Using a mixer, whisk sugar and butter until light and fluffy. Spoon in ricotta slowly as you go, mixing on a slow setting for a few minutes. Add the buttermilk in the end. Add the dry mixture as you fold it in gently to make a smooth batter. Pour over the cherry layer in the pan. Bake at 180°C for about 30-40 minutes, until it has risen firm and a toothpick inserted in the center comes out clean. Remove the pan from the oven and allow to cool completely. Run a knife along the rim of the pans, release the springform. Remove gently. At the expense of adding to your calorie count through sugars, feel free to douse the slices in ginger-sugar syrup. Heavenly! *Recipe is for 8 servings; all values in grams.